As the year draws to an end it’s that time to take stock on the year just gone and to spend a little time being grateful for what you have. It’s also that lovely time of the year, when, if you are as fortunate as I am, to have the closest people to you enjoying your food and having a merry time at the dinner table. Tonight’s meal was a real Kiwi BBQ with steak quickly seared to melt in your mouth perfection (not my skill I might add, so thank you David!). My contribution was some tasty vegetable dishes. Yummy sweet potato cooked in cream, garlic, onions and butter aka Sweet Potato Dauphinoise, lightly steamed Broccoli with grated nutmeg and my new favourite, Roast Pepper with Goat’s Feta. So going back to thoughts of gratitude. It can be very grounding to just take a moment or two, on a regular basis, to just think of somethings that you are grateful for. I find it quite uplifting in times of stress to just sit quietly for a few moments and to almost draw this as a cloak around me. The few minutes it takes to think of a few things you are most grateful for are quietly uplifting in the hurly burly of life. But enough said, the new year is coming up very quickly so it’s back to the kitchen with a simple recipe to add to summer BBQ’s or a winter meal. Easy as anything to prepare, so what are you waiting for! Coat with 2 tbsp oil and bake for 10 to 15 minutes or until tender. 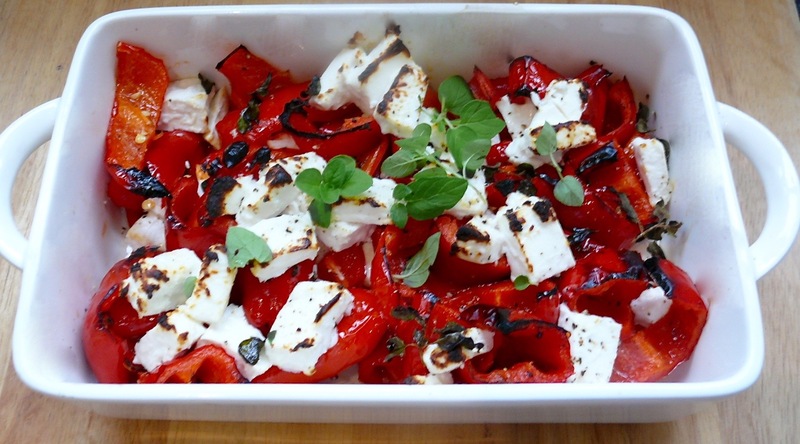 Slice feta into bite sized pieces and add to the roasted pepper. Pour over the last tablespoon of oil. Change your oven from bake to grill/broil and place peppers under the heat until a little blackened. Remove and add herbs then season to taste.